In the last year for this illustrious platform, research within the community showed that only 287 1999 Mitsubishi 3000GT VR-4's were imported to the United States. This makes the 1999 3000GT VR-4 one of the lowest production numbers of any car. 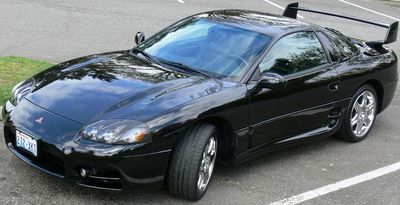 If you leave out any car that costs over $100,000, the 1999 Mitsubishi 3000GT VR-4 is one of the lowest production cars of the era, second only to the 1998 Mitsubishi 3000GT VR-4 within Mitsubishi's product segment. Do you currently, or have you ever, owned a 1999 Mitsubishi 3000GT VR-4? If so, then please send us an email at registry@3swiki.org. You can also edit this page yourself by searching for your VIN below and claiming your '99! Latest update: March 10, 2019. JA3AN74K5XY001052 BLK BLK 205000 Linden MI 3rd June 98 62 kathsellsall! JA3AN74K5XY003075 BLK BLK 94500 Colorado Springs, CO 2nd July 99 249 Ruben Silva Jr. This page was last edited on March 10, 2019, at 18:51.